As part of my role as Chair of the Commonwealth Parliamentary Association Modern Slavery Project I brought together members of Commonwealth parliaments and key stakeholders in the battle against modern slavery. In particular the deeply concerning use of bogus orphanages to syphon money and resources away from the needy. The meeting was arranged to coincide with the Commonwealth heads of government in London. An estimated 8 million children live in orphanages and other institutions across the world. More than 80 years of research has demonstrated that children raised in institutions are more likely to suffer life-long physical and psychological harm and experience dramatically reduced life chances. Over 80 percent of children in institutions are not ‘orphans’ and have at least one living parent. Poverty, disability, and marginalization tear children from their families. Institutions often promise food, shelter and education – yet these promises are rarely delivered. There is a growing body of evidence highlighting how many children are being exploited: trafficked in and out of institutions, becoming victims of modern slavery. ‘Orphanage trafficking’ is the active recruitment of children into residential institutions for the purpose of exploitation. Evidence across a number of countries highlights that children are removed from their families and placed in residential institutions (so-called ‘orphanages’) to attract funding and donations from foreign tourists, international charities and others. In many cases, parents are deceived or coerced by recruiters who visit poorer rural communities on behalf of orphanage directors to place their children in institutions on the promise of an education and a better life. Once in these institutions, children are often held in slavery-like conditions and/or subject to a range of exploitative behaviour and abuse – sexual, physical, psychological and forced labour / services. This is fuelled by vast sums of international money flowing into the country to support orphanages which creates a demand for children. Much of this money does not go to supporting children, but acts as an incentive, creates a market, to supply children to fill up orphanages, to encourage and meet the support of often, well-intentioned donors. This event will share recent developments in the recognition and response to tackling orphanage trafficking, and will highlight practical steps that can be taken to address the issue. Tackling modern slavery is vitally important to ensure that human rights are protected around the world. After meeting with Lumos – a charity established by J.K. Rowling to tackle bogus orphanages who put children into modern slavery to make a profit – I was determined to bring together Commonwealth parliamentarians and key stakeholders so we could better understand this heinous crime. The meeting was a success and I hope the bridges we have built will help us tackle modern slavery more effectively across the world. The other important lesson that comes from this is that people should check carefully who they are giving money to when donating to orphanages around the world. We heard of devastating stories from Haiti where children were taken from parents for a small payment so that they could be used to syphon money from real orphanages. I know of a few cases in Delyn where well-meaning people have been defrauded by these morally bankrupt organisations. The Commonwealth is an important organisation and events, such as these, demonstrate why we need to maintain a close relationship with our international partners. I hope that all that attended took away lessons on how we can bring this to an end. 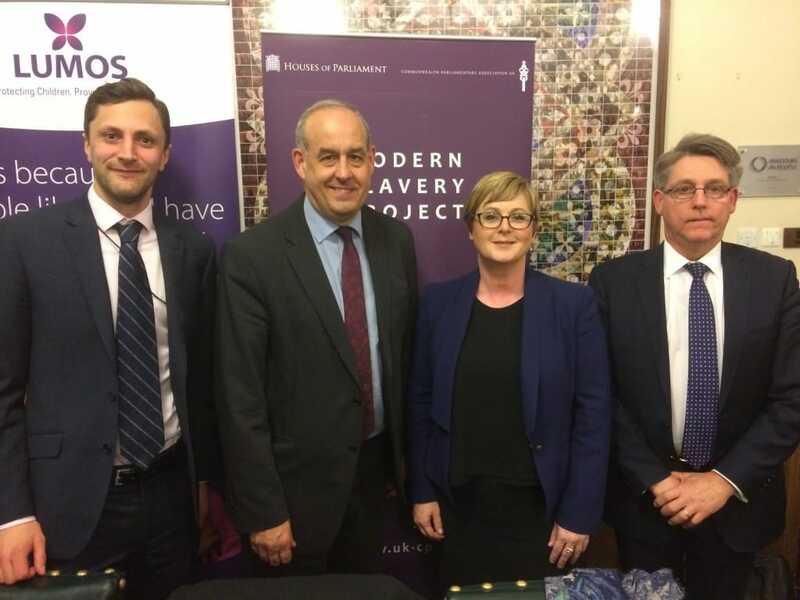 In the photo is (from left to right) Alex Christopoulos (Deputy CEO, Lumos Foundation), David Hanson MP, Senator Linda Reynolds (Australian Parliament) and Kevin Hyland OBE (UK Independent Anti-Slavery Commissioner).